This exceptional book in FULL COLOUR (Jose Mourinho Attacking Sessions) (formerly called Attacking & Finishing Training Sessions) is the first in a series of books which provide you with a blueprint of how to attack and score goals like the world’s best teams. Michail is a UEFA ‘A’ license coach and has provided a full and extensive analysis of Real Madrid’s best 48 goals in the 2011-2012 season, when they scored a record 121 goals to win the Spanish Championship (La Liga). This goal analysis of Jose Mourinho’s tactics has been used to produce 114 practices organised into 30 ready-made sessions . Each goal is analysed, followed by a full session on that specific topic of Real’s attacking play, with clear colour diagrams, detailed descriptions and coaching points. 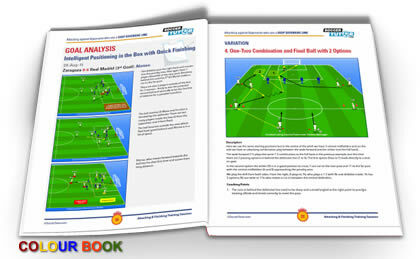 You can use these ready-made sessions to practice Real Madrid’s attacking play and combinations. You can learn exactly how Real found attacking solutions for every tactical situation created by opponent’s who defended with a deep, middle or high defensive line. 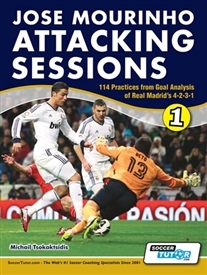 Learn how to Attack in the 4-2-3-1 and Coach your team to play like "the best counter attacking team in the world"
A large section of this book is based on the transition phase. You can learn how to coach your team to play like ‘the best counter attacking team in the world.’ There are sessions on the transition from defence to attack in the low, middle and high zones. The season in which all these goals were scored was 2011- 2012 when Jose lead Real Madrid to the Spanish championship (La Liga). I think this is a book which provides content that has not been produced before. We have combined a comprehensive analysis of the phases of play which lead to goals with training exercises that can be used for coaches to train the 4-2-3-1. 1. We analyse Jose Mourinho’s tactics and the phases of play which lead to Real Madrid’s best goals and how to recognise and find solutions against different opposition’s formations and tactical situations. Learn how to coach your team to play like "the best counter attacking team in the world "
Easy to learn and to put into practice & Thumbs Up!